GATE CITY — A swimmer from Scott County has made a name for himself at the state level. R.J. Goins, a junior at Rye Cove High School, recently earned a gold medal in the Virginia High School League Class 2 500 freestyle swimming competition. 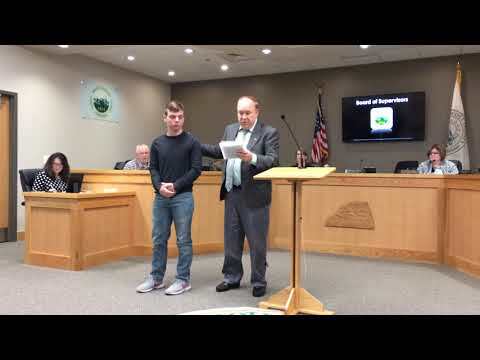 He was recognized on Wednesday by members of the Scott County Board of Supervisors, who presented him with a plaque during their monthly meeting. “You made Scott County proud, and Rye Cove, I think they’re proud of you, too,” said BOS Chairman Danny Mann. Last year, the BOS began recognizing students who have excelled in academics or athletics. Past honorees include a forensics state champion and the Gate City High School boys basketball team. BOS member David Redwine noted that Rye Cove doesn’t offer a swimming program, yet Goins was still able to excel on an individual level. • Congratulated John Ferguson, superintendent of Scott County Schools, for being named Superintendent of the Year for Region 7, which covers 19 school divisions. Ferguson is one of eight superintendents being considered for the honor at the state level. • Approved a $1,000 donation for the annual Nickelsville Days festival, which will be held May 24-26. The event will feature music, a veterans ceremony and other activities. • Approved a Moccasin Gap study, which will present the county with project options to improve the traffic flow on Kane Street in Gate City. • Proclaimed March as American Red Cross Month in the county, designating it as a time to recognize and thank those who volunteer, donate blood, take lifesaving courses or give donations to the Red Cross.